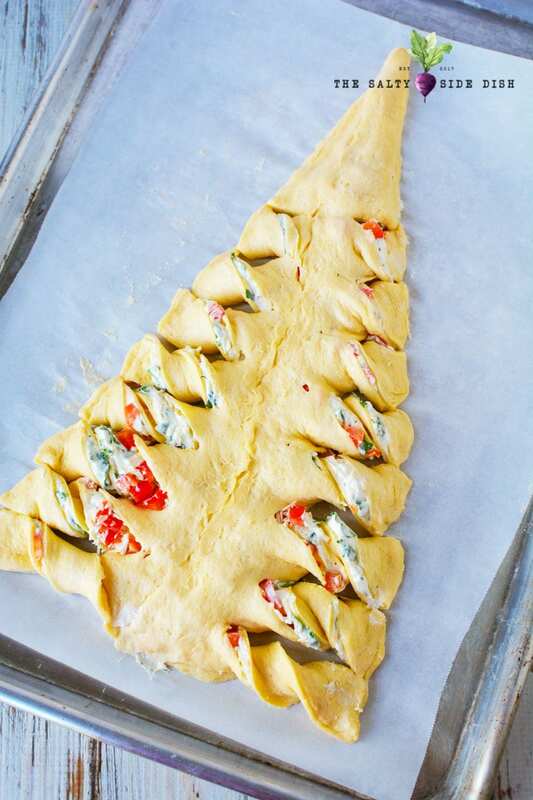 Christmas Tree Pull Apart Bread is a perfect Christmas Appetizer. Shaped in a tree, this pull apart bread is not only beautiful but delicious. Incredibly easy to make, you cannot go wrong with the creamy texture and slightly crunchy peppers are the tree branches. Such a cute appetizer or premeal snack and Fantastic for a Christmas Party! It’s that time of the year again. When you attend about 100 parties or host about a 100 parties. While everyone is looking for the perfect part side dish, you can rest easy that this Christmas tree pull apart bread fits the bill. Incredibly adorable and easy to stuff with, well, whatever you love, this Christmas Tree Pull Apart Bread is a fun way to set up a goodie filled table with delicious bread that you can twist and eat! 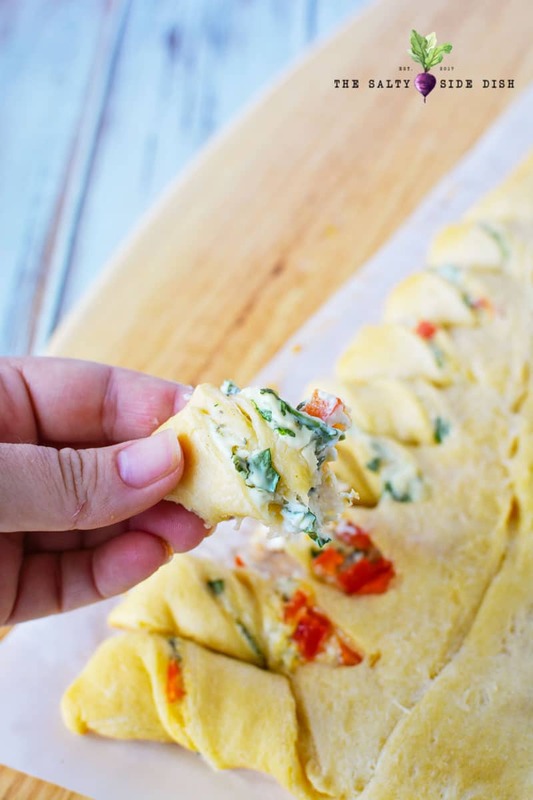 My pull apart bread recipe includes cream cheese and fresh veggies to give it a little bite, but you can easily make it sweet by including nutella or a full main dish recipe by making your tree into a pizza. This cream cheese appetizer is pretty easy, just about 10 minutes to whip up and 15-18 minutes of baking. If you are looking for other easy and awesome side dish ideas, I love these bacon wrapped jalapenos and this party friendly taco dip. Whatever you make this season, just enjoy it! No need to stress about dieting or family drama, just have some food, relax a little, and be happy in the holiday season. Isn’t the Christmas get together a great way to have an excuse to eat anyway? If I remake this Christmas Tree Bread, what would I do differently? Making again, I think I needed to cut it a little more into the center so the center is smaller and its a more compact tree. 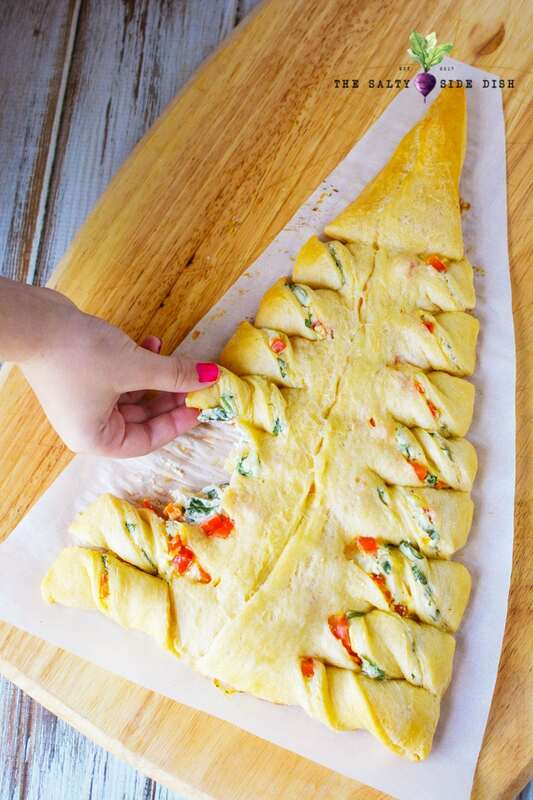 You can also turn this into a pizza tree by altering the inside ingredients! So fun! Man you will love this creamy cheesy dish! And its so great to share with a crowd. Grab, pull, and munch down! You can also take this time to include some veggie dips or another recipe complimentary to dipping your bread. Of course if you need other amazing recipe dishes to share with a crowd, try Cowboy Caviar, Homemade Queso Dip, or even this Christmas Cookie Dough Cheese ball. YUM. Like SO yum. And if you are looking for more food fun, this Caprese appetizer that is shaped like a lady bug is about THE cutest recipe EVER. Not that ladybugs are holidays exactly but cute food is always in season! Now let’s get started on the main recipe! As always, preheat oven to 375. If you do not pre-heat you are going to throw off all your timing so start with that. In a small bowl, combine cream cheese, sour cream and spinach. Line a baking sheet with parchment paper and unroll dough. Parchment paper helps things not stick and if you have never used it before, its pretty much a life saver. Press dough into a large rectangle. Spread cream cheese mixture onto the large tree triangle. Sprinkle with peppers and cheese. 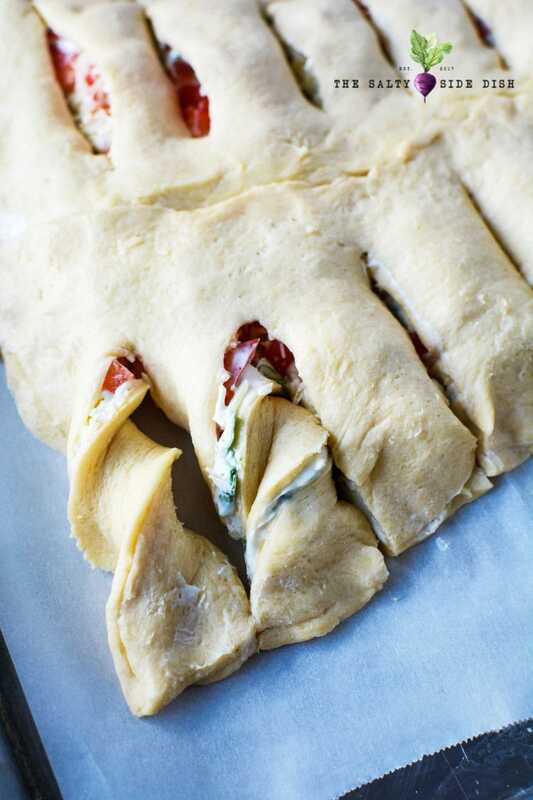 Place remaining dough pieces on top of the cheese and gently press the center seam together. Continue to press the outer seams together to seal the dough. 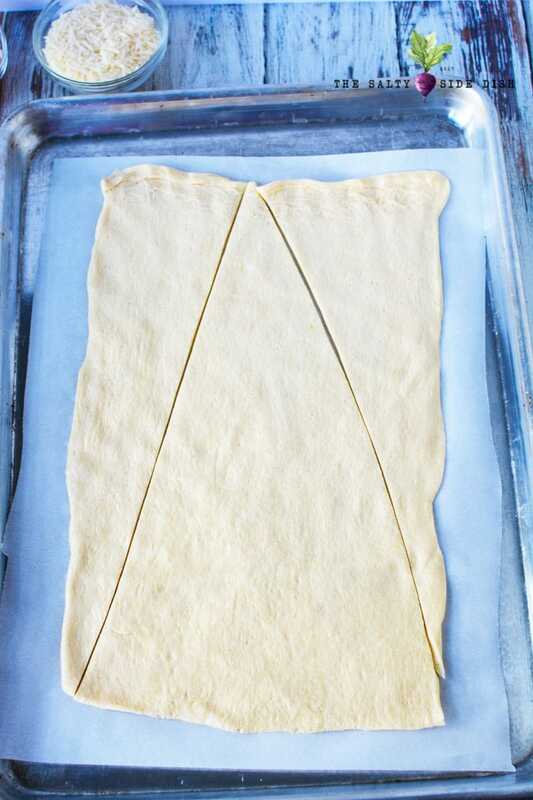 Use a knife to cut 1″ to 1.5″ slits into each side of the triangle dough, leaving about .5 – 1″ in the center uncut. Starting at the bottom, pick up each piece of dough and twist it twice and replace it on the pan. Continue up the row of dough strips (these are your tree branches). You may find you will only need to twist the short ones once instead of twice. Let stand for 5 minutes before serving warm. Serve along side Red Sangria. Christmas Tree Pull Apart Bread is a perfect Christmas Appetizer. Shaped in a tree, this pull apart bread is not only beautiful but delicious. Incredibly easy to make, you cannot go wrong with the creamy texture and slightly crunchy peppers. 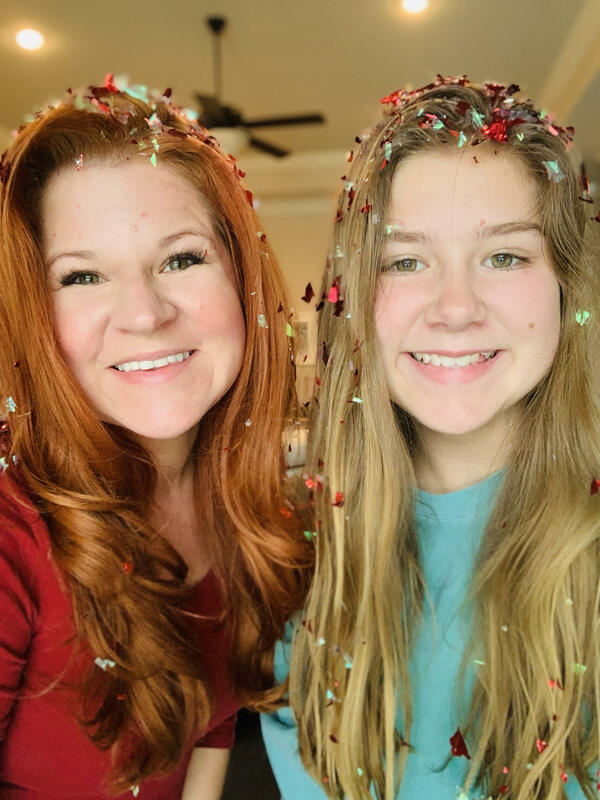 Perfect for a Christmas Party! In a small bowl, combine cream cheese, sour cream and spinach. Mix well. Line a baking sheet with parchment paper and unroll dough. Press dough into a large rectangle. 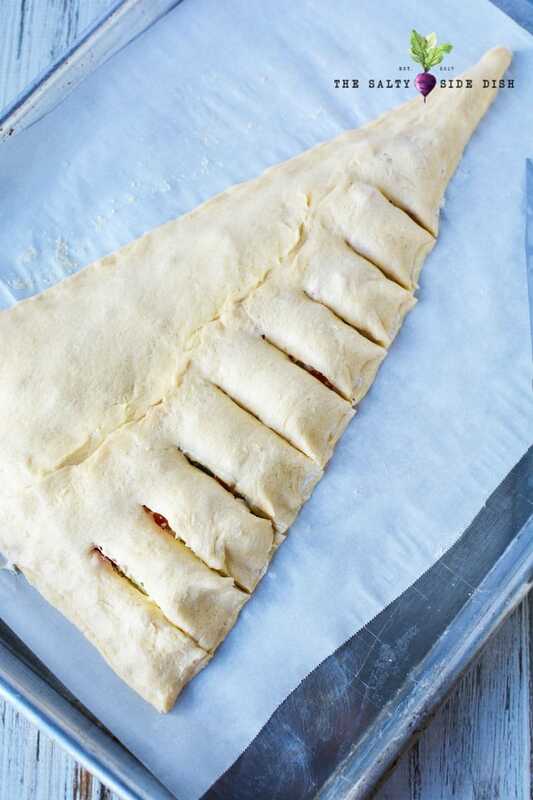 Cut dough into a triangle shape, saving the excess pieces. 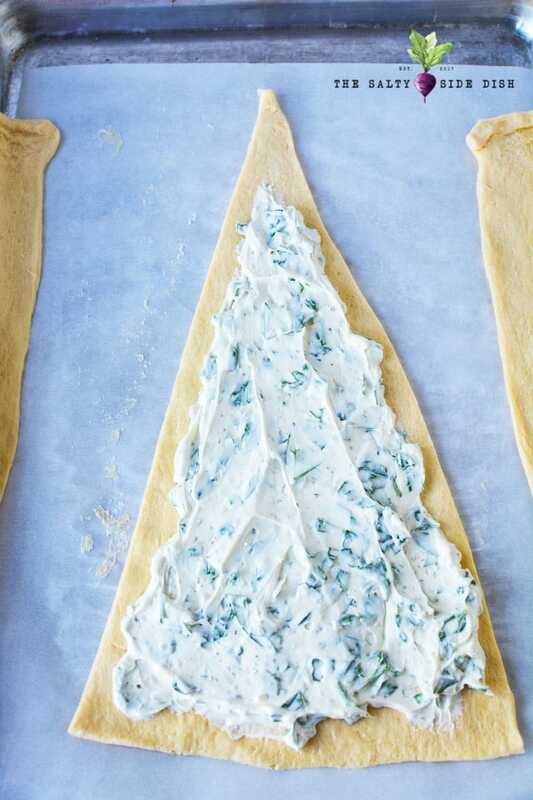 Spread cream cheese mixture onto the large triangle. 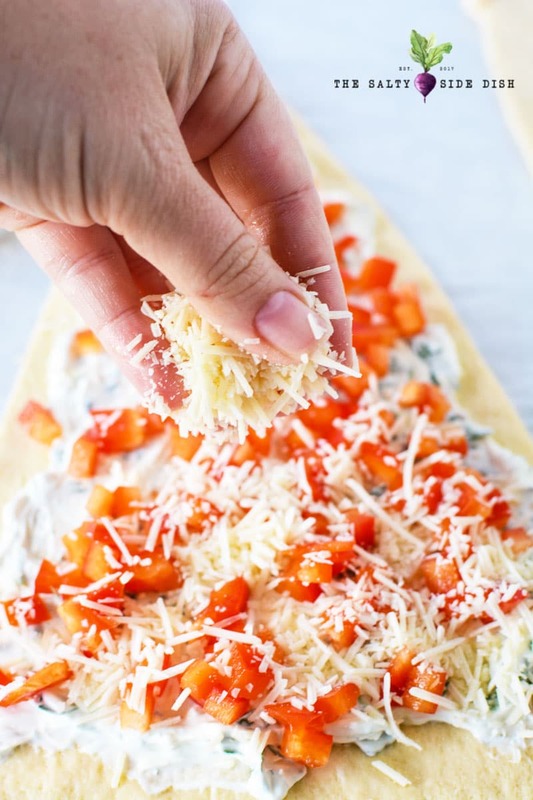 Sprinkle with peppers and cheese. 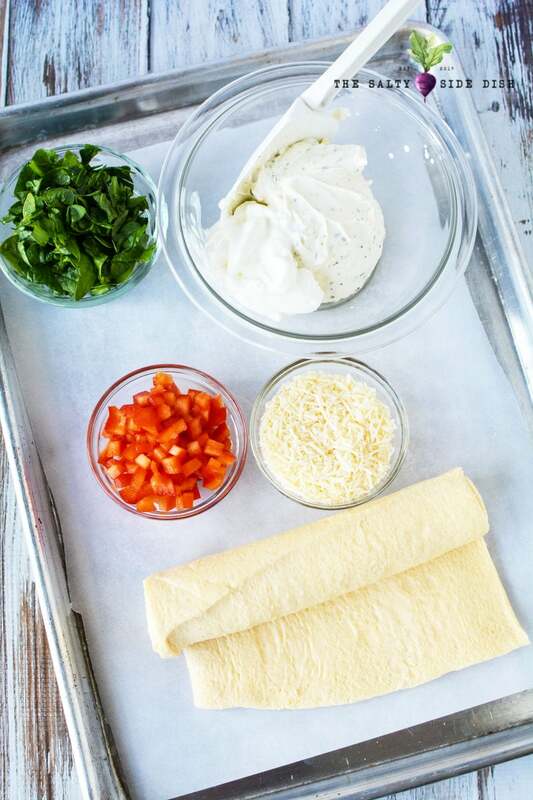 Place remaining dough pieces on top of the cheese and gently press the center seam together. Continue to press the outer seams together to seal the dough. 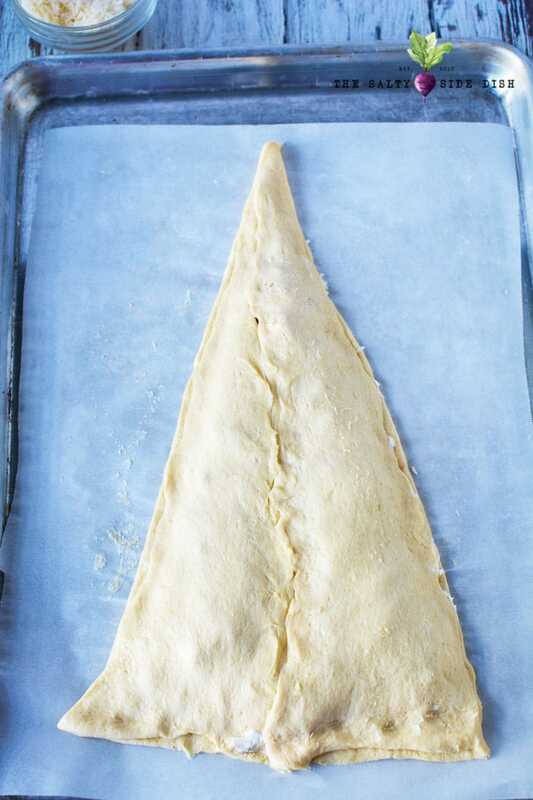 Use a knife to cut 1" slits into each side of the triangle dough, leaving about 1" in the center uncut. Starting at the bottom, pick up each piece of dough and twist it twice and replace it on the pan. Continue up the row of dough strips. You may find you will only need to twist the short ones once instead of twice. Bake for 15-18 minutes or until golden brown. Let stand for 5 minutes before serving warm.